Are you looking for a personal lubricant that's kind to your skin and the environment? If your answer is YES then OB Plant-Oil Based Natural Personal is for you! It boasts a luxurious plant-oil based formula which is nourishing and gentle on the skin giving lasting lubricity and comfort. Thoroughly researched and responsibly formulated, YES lubricant boasts a range of original, effective and certified organic ingredients to pamper and nourish your skin. Elegantly and discreetly packaged, YES has the power to change your world from the inside. YES lubricant contains no parabens, glycerine, hormones or known skin irritants making them great for those with allergies and skin sensitivities. 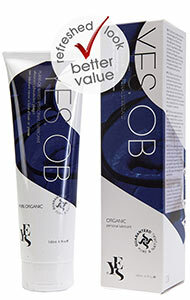 Say a big YES to organic personal lubricant. Yes to superior quality and YES to the environment.